My father, Alec Andrews Sneath (b.1890, Bowthorpe Park, Witham-on-the-Hill, Lincs, d. 1948, Cape Coast, Ghana) came from a farming family in south Lincolnshire. The family later moved to the village of Thurlby-by-Bourne, Lincs, where my grandfather, Henry Andrews Sneath was a prominent farmer and hay-and-straw merchant. Henry Andrews’ mother Rebecca was descended from Henry Andrews of Royston (born near Grantham), schoolteacher and mathematician, fl. 1780-1800. My mother was Elizabeth Maud Adcock, (b. 1887, Desford, Leics, d. 1967, Oadby, Leics). She was the daughter of Thomas Draper Adcock of Leicester (ca. 1850-1924) and of Mary Esther Coltman (she was related to the Coltman family who were hereditary freemen of the Framework-knitters’ Guild, probably through Thomas Coltman, butcher, admitted 1852; Records of the Freemen of Leicester, v.2, p.327). Thomas Draper Adcock was a schoolmaster, who taught at the Leicester Working Mens College. He was later the first headmaster of Desford Industrial School, Leics (Victoria History of Leicestershire v.3, p.259), which was in part an early attempt at a reformatory school. He is said to be recorded in the Victoria History of Leicestershire as being associated with the early days of Vaughan College, now part of the University of Leicester. My mother’s brother was Sir Frank Ezra Adcock (1886-1968) of King’s College Cambridge and Professor of Ancient History in the University of Cambridge. My father and mother first met when Florence Wade of Thurlby, a maid at the household of Thomas Draper Adcock, took my mother to visit Thurlby. My father was a Methodist missionary who followed in the steps of his greatuncle Henry Andrews, sister of Rebecca Sneath nee Andrews who was the mother of Henry Andrews Sneath of Thurlby; Henry Andrews died in 1853 at Port-of-Spain, Trinidad. My father was a teacher, first at Mfantsipim College, Cape Coast, Ghana, and later Principal of Richmond College, Galle, Sri Lanka, where I was born. In 1932 I went with my brother Frank (1927-1978) to school for a time in Thurlby, before going on to Wycliffe College, Stonehouse, Glos., and then to King’s College Cambridge. I studied medicine, and moved to King’s College Hospital Medical School, London where I qualified in medicine and specialized in pathology at King’s College Hospital, London. I joined the Royal Army Medical Corps and served my National Service in Malaysia, 1950-1952. In 1952-1953 I studied at the London School of Hygiene and Tropical Medicine for the Academic Diploma in Bacteriology. Then I entered the scientific staff of the Medical Research Council at the National Institute of Medical Research, Mill Hill, London. 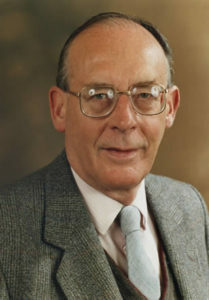 In 1964 I became the Director of the MRC Microbial Systematics Unit at the University of Leicester, and in 1975 became the first Professor of Clinical Microbiology at the new Leicester Medical School, and Honorary Consultant Microbiologist, Leicestershire Health Authority. When I retired in 1989 I was made Emeritus Professor of the University of Leicester. Most of my work has been directed to classifying and identifying micoorganisms using computer techniques. As part of this I developed with Professor Robert R. Sokal (of the University of Kansas and the State University of New York, Stony Brook, New York) the new field of numerical taxonomy, which has been employed in a wide range of disciplines. In addition I have been involved in the reform of the International Rules for the names of bacteria. I am a Methodist, and my interests include gardening, natural history, music, literature and archaeology. In my younger days I was especially interested in microscopy, and formed a large collection of microscopical objects. Computing has recently become an interest.